With the Weston Pro 2300 Stainless Food Vacuum Sealer and its heavy-duty construction, you can expect top of the line performance. The Weston Pro 2300 is perfect for protecting and sealing vegetables, fish, game, domestic meats, or your personal possessions like valuable documents and silver. 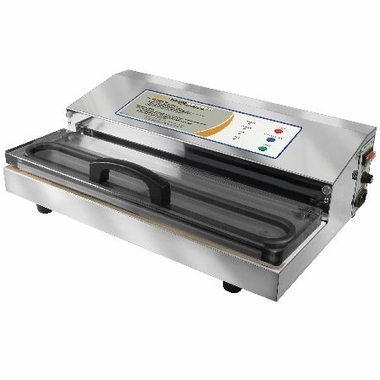 Please note: All Weston Vacuum Sealers are �out of chamber� sealers. As with any �out of chamber� sealer, household bags and all other non-textured or non-embossed bags are not compatible and should not be used. For best results, bags containing a textured or embossed lining are required. Have used the the low end sealers (brought 3). No use comparing since there really isn't. The 2300 is a serious vaccum sealer. From the vaccum pressure to the quality of the seal which is much wider than a pencil lead. The quality of the machine itself is apparent immediately. Waited far too long to enjoy this! Had if for 4 years now. Definitely worth the money compared to the cheap models sold at big box stores. To the guy who can\'t seem to get all the air out - If there is too much bag, and it covers the hole in the tray, it will do just what you\'re describing. I trim the bag so it doesn\'t go more than half way into the sealing chamber, and that does the trick for me. I finally started using mine yesterday. I'm not sure what I'm doing wrong, but it's not taking all the air out of the bag before sealing. It does seal well ... but it's just not shrinking the bag around the food. I appreciated getting this delivered in a very timely manner. I'm hoping that I end up satisfied. I received my Pro 2300 within the posted delivery times. The order process was easy and quick. Thank you for a great product at a great price. The Pro 2300 vacuum sealer from Weston is an awesome machine! Not the mass produced throw away junk we probably all started out with but a real commercial duty machine. It's truly worth the extra money, and I wish I would have bought it years ago. This is the one that you want! I had a Food Saver before this & it had problems with poor sealing if it was used only a few times at once without letting it cool for at least 5 min. With this sealer I have sealed over a hundred ears of corn (3 to 4 ears per bag) constantly only waiting long enough to load another bag. Never overheating or a bad seal. Has a wide seal and doesn't matter if it's wet, will still seal up good. I do a lot of garden vegetables to freeze for winter, freeze about 40 chickens cut up, game birds,fish, deer, elk.... I have had this almost 2 years and have used it well over 1000 times, worked flawless. I did a lot of research before buying this & if I ever have a problem I will get the same one again. Quality costs a little more but it's well worth in. This vacuum sealer will out perform any store bought unit by far. The 15 inch sealing bar makes it essential for sealing large bags with ease. Very powerful unit, I recommend to all. I have owned several food saver vacuum sealers. This one puts those to shame. It is much quicker, the transparent lid allows you to see exactly where the top of the bag is located, the drip tray is very easy to clean out. Great product. Worth the increased price. This Weston costs me twice more than the Foodsaver FM5xxx. Half of the sealed bags sealed from Foodsaver were leaked after 1 week in the freezer. None of bags being sealed by this Weston leaked at all, so far for 2 weeks. This Weston is also much quiet. I feel the Weston is worth my money. I like it. I process all of my family's hunting meat. I have used (and owned) several vacuum sealers in the past and this one is very impressive. My favorite part is that the sealer makes a thick seal, not pencil thin like other sealers. I haven't used this during hunting season, but so far it works great. After, I finally got to use it. I L O V E it. Very quite operations, love the auto / hands free use. I also used the manual option on this item, Got to get use to the 1 second delay, so you just have to hit the manual button, just a little sooner, but that\'s ok. Didn\'t realize how heavy the unit was, until I went to take it out of the box. But that just mean, GREAT, solid, quality construction. Definitely more of a professional sealer -- forget the Foodsaver brand; I've had to replace 2 new ones. Go with the Weston and you won't have to replace another one 3 times! Awesome sealer! I have had two food saver brand sealers. I don't curse, but food saver made the words come to my mind. This sealer is the cream of the crop. Go ahead spend the extra money. It will save you in the long run. The others won't last, and your time and sanity are worth it. I bought the Weston bags as well. I am sad to say I was disappointed with them. Sealer is great though, I bellieve you will be happy with your purchase. I have owned several vacuum packers over the years. For the past 6 years I have used the Weston 2300. I have butchered and packed the following: 3 1,000# cows 5 250# pigs hundreds of deer thousands of misc. chicken , sausage, vegetables and much more. I have had to change the seals and heat strips 2 times. This is the best packer out there until you get into thousands of dollars. The biggest complaint is getting liquid into the pump. This is easy to avoid. When we pack fish or anything wet we fold a strip of paper towel and insert it into the bag. This will catch any liquid and prevent it from getting out of the bag. It will not spoil or change the flavor of the food. I have been doing it for many years and we are in great health. The next biggest complaint is the bags. I have found the vacmaster bags to work the best for me. For 1 pound of meat we usually cut the 8x12 bags down to 8x9.5". The machine does not have to work as hard and it speeds up the process. I just purchaced a new machine just because mine is 6 years old and the price was great. I will continue to use it until it dies, probably in another 10 years or so. Buy the 2300 use good quality bags and watch the liquid and enjoy your food . We have kept food frozen over 3 years with no apparent loss of flavor and no freezer burn! Very pleased. Simple to operate. Sturdy. Great performance. Highly recommended for those looking for a sturdy vacuum sealer that performs! I commend the outstanding help from Harvest Essentials sales associates, they were very friendly and did an outstanding job on answering my questions and getting the information i needed, The product the Weston Pro 2300 Stainless Vacumm Sealer which surpasses all expectations, is built to last a good many years. The product works amazing and was shipped very quickly. I am very pleased with this vacuum sealer. It can handle 15" wide bags, which is perfect for whole briskets. The sealed surface is much wider than that of the smaller food sealer that you see on TV, and it provides a much stronger seal for the bag. This is an excellent product that performs exactly as I expected. After burning out other sealer brands over the years I decided to invest in a high quality sealer. I package multiple elk and deer each year and the Weston 2300 has been flawless so far. Harvest Essentials provided the best price, great fast service and free shipping. Can't go wrong here! This vacuum sealer is just what I've been looking for. I hunt wild hogs and fish a lot and the 2300 does a great job getting the air out of my freezer storage vacuum bags. I'm very pleased thank you. received it very quick in excellent condition. works as expected, great. Sealer works great. Glad I didn't spend thousands of dollars on a chamber unit like I was intending to do. I had purchased a cheaper vacuum sealer before and was not satisfied, I read the reviews of the Weston Pro 2300 vacuum sealer and decided to give it a try. I was NOT disappointed, the machine is powerful and continues to operate with multiple sealing's, one after another. Very satisfied. We are very impressed with this vacuum sealer. We vacuum pack about every day. After using two other brands that have nothing but trouble and frustration;this does everything great. The packets are vacuumed until they are tight and the broad seal keeps them that way. A great machine! butchered 8 hogs; packaged chops, roasts, butterflied loin, ribs, bacon; unit did great! Great service; shipped quickly and much faster than expected. This is an excellent vacuum sealer, and beats Food Saver by a mile. While it costs more, it will easily outlast the competition. It's a snap to use and the wide sealing bars ensure the seals won't fail. By far the best investment in a vacuum sealer.